The Colombian Countryside Film Festival is a space for the promotion, distribution, and support of national film works. Through our activities, we guarantee the circulation and appropriation of national films even while providing tools to rural communities for them to participate actively in the construction of their own image. 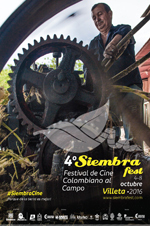 The festival is an itinerant showcase of Colombian film that reaches rural communities in the department of Cundinamarca. It seeks to take film to unconventional places, making interventions in public space and creating alternative screening scenarios that promote encounters between the language of film and popular art and culture.